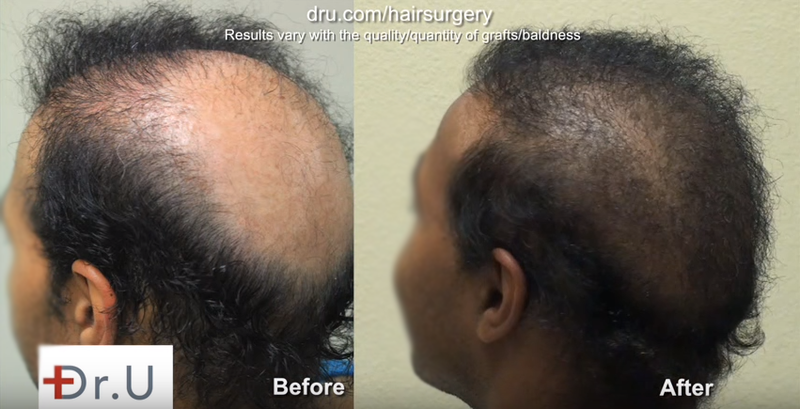 Up until transforming his life with Dr. U’s remarkable surgery, this patient had relied on a hair piece and hats to cover up his extreme baldness. Even after undergoing several surgeries at other clinics, the patient was left with a large strip scar, an unnatural looking hairline, and above all, severe baldness. Beginning in 2007, the patient underwent a series of surgeries to not only undo the damage done from previous surgeries, but to also improve his hairline, hair, and confidence. Read more about this incredible procedure here. The amount of grafts and sources that provided successful results. 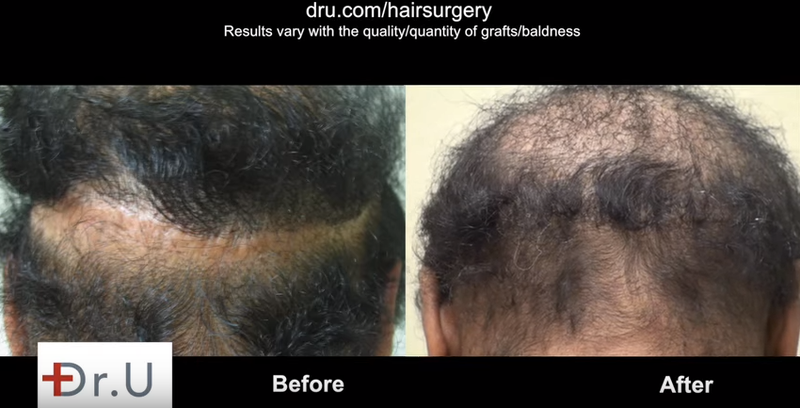 Even in patients, such as this, that have a depleted hair donor source, UGraft is still able to provide a successful transplantation. By using body hair, the patient can expect hair that looks natural because it is natural. This further increases the donor pool for patients who may not be able to provide a sufficient enough pool via the patient’s head. The patient was given a new lease on life and more confidence than ever before. The surgery provided him with a soft and natural hairline that was crafted using mostly chest and abdomen. Using the UGraft system and a calculated combination of scalp micropigmentation – SMP efforts, Dr. U was able to cover up previous surgeries that left the patient with a “pluggy” look and a visible scar using beard and armpit hair. The results speak for themselves. Before and After surgery results of newly transformed temples and side. The surgery scar left behind from previous surgeries is no longer visible. The photo above clearly shows the surgery scar created during an antiquated surgery was covered up and appears natural among the rest of the grafts. All of the photos above are only after 3 months of hair growth after the final surgery. In a short amount of time and with minimal pain, the patient has excitedly found no more use for his toupee or any reason to wear hats. His confidence has improved and he no longer has to worry about his hair. 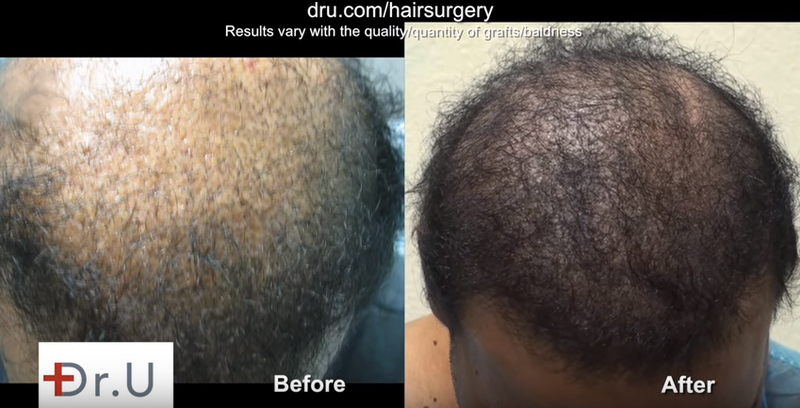 The YouTube video above provides the complete picture of this patient’s journey from NW 7 baldness to a natural looking and ever-improving hair. 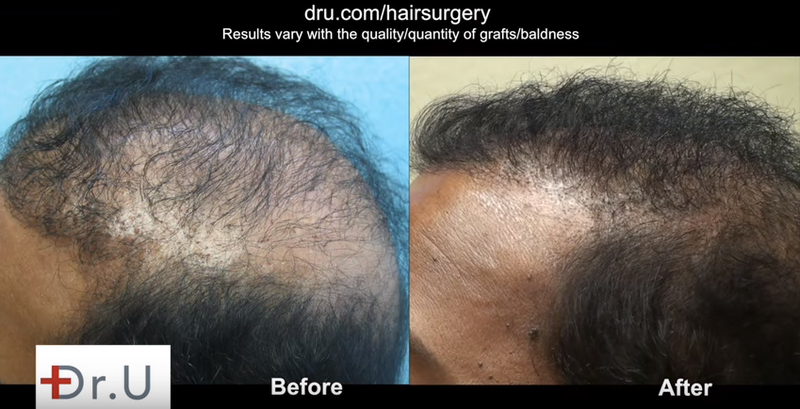 In the video, you will see how Dr.U’s UGraft system and years of expertise have improved the patient’s hairline and even his hair growth. Taken a short time after his final surgery, the patient happily explains how these surgeries have transformed his life and given him hair that he can brush, wash, and comb. This forum is about stem cell treatments and hair multiplication. I realize your post is about a new technique, but it’s still about hair transplants, so it belongs in the HT forum. Thanks.